I'm really hoping to get this block finished up soon. There's a lot of stitching in it, so it seems to be taking forever! Well, nothing else going on here.... Just hanging out with the kids. Write soon! I love those peacocks! Are they on guard? ;-) It's a lovely block. I can't believe how quickly you're zipping through these blocks! I really love watching your progress on this piece. 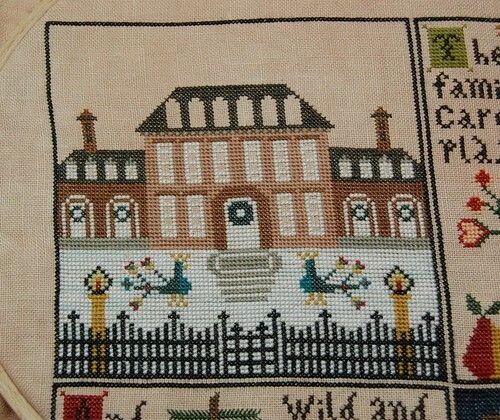 It is beautiful, but it looks like it's really so stitch-intensive! Do you stitch on the hoop, or is it just for show for the photograph? Gorgeous stitching. You'll soon have it finished. Beautiful stitching. I like watching this one. It's looking great, Nicole! You're almost done with this one! It seems there's a lot of stitching in quite a few of these blocks. But they're so worth it!! You are just a whiz! This is really looking beautiful! I love that block !!! Keep it up! Beautiful, Nicole. Absolutely beautiful!!!! I just pulled all the threads for this and you make me want to start tonight.... bad stitcher, bad stitcher! CaHRH is coming along nicely! I am relatively new to your blog and I have thoroughly enjoyed reading it. You have beautiful stitching! I look forward to more progress pics! It's such a beautiful block! Great colours. It looks like you got most of the stitching done for this block, Nicole. Another beauty! Very inspiring, and I agree, lots of stitching on this one: I'm *almost* done with the snow, then there's still that huge building! It really is gorgeous and you are moving right along on it. It really is a gorgeous piece. I don't think the picture on the cover does it justice. I am so enjoying watching your progress on it. Love your progress. I can hardly wait to see it all finished. Wow, what an intricate block!! 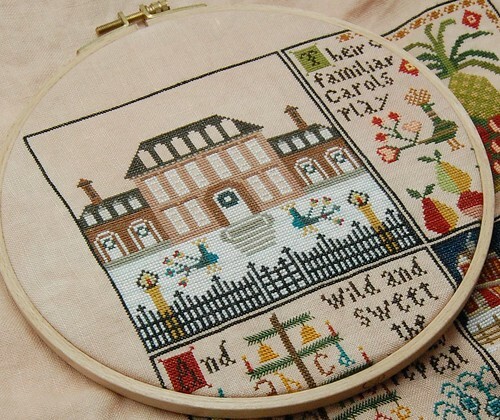 Do you usually stitch with a hoop? I haven't stitched with a hoop in a long time...but I hate stitching in hand on a HUGE piece. Lovely progress! Oops, just saw your answer about the hoop - good idea! Nicole, fantastic progress!! You're really zipping along. YGG! You'll have this whole thing finished in no time!! !